We had the pleasure of attending CRE // Tech Intersect on June 18th in San Francisco. Intersect, for those of you who have yet to experience this fantastic event, is the commercial real estate industry's leading symposium on emerging and innovative technologies. CRE // Tech (not to be confused with our very own CRE Tech, Inc.) is the organization that hosts this joining of commercial real estate and technology. We attended Intersect for the first time at its debut event in Austin during SXSW this past spring. We got to listen to an informative panel of speakers and browse the latest technology designed to advance the industry. We immediately knew TheAnalyst®PRO needed to be a part of it. So in San Francisco, we set-up a demo station on the 46th floor of the landmark 101 California, overlooking the beautiful bay. 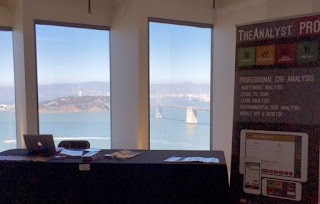 Over the course of the event, we presented TheAnalyst® PRO to many of the 300+ attendees. 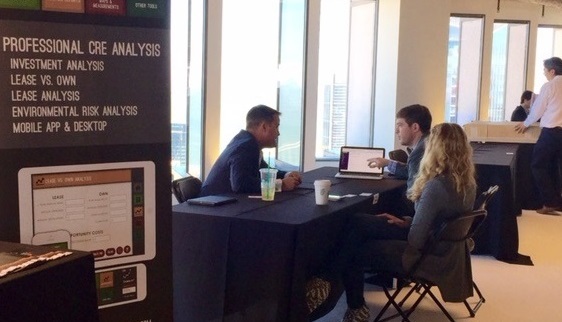 This is our favorite part of what we do—showing brokers first-hand how this app makes their jobs so much easier. Plus, we were able to share the features of our soon-to-be-released app enhancements: the Aerial & Location Map Tool and our newest Location Risk Analysis Tool—Environmental Hazards. In speaking with the attendees, we were reminded of our impetus to develop TheAnalyst® PRO: commercial real estate often lags behind in the technology sector, especially when compared to residential RE. Yet, there is a great need for information, accuracy, timeliness and mobility that technology easily affords. We at CRE Tech, Inc., are excited to be at the forefront of this technological push. By collaborating with fellow industry professionals, we hope to strengthen the union of tech and commercial real estate. 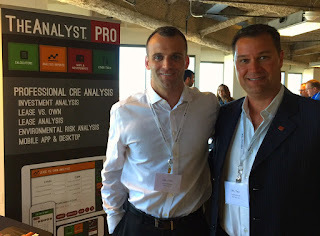 Tom Byrne (left), former president of LoopNet, and Todd Kuhlmann (right), founder of CRE Tech, Inc.
Pierce Neinken (left), founder of CRE // Tech Intersect, and Todd Kuhlmann (right), founder of CRE Tech, Inc.
We are looking forward to once again demonstrating TheAnalyst® PRO’s ever-expanding capabilities at the next Intersect in NYC this October.